Príosún Chill Mhaighneann - Kilmainham Jail. At four minutes past noon on Easter Monday, April 24th, 1916, a sudden hush fell over O’Connell Street. 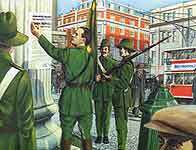 From the steps of the General Post Office Patrick Pearse (Pádraig Mac Piarais) read the Proclamation of the Republic. This is the tragic story of Joseph Mary Plunkett at age 28, patriot, scholar and poet, and Grace Gifford, patriot and artist. Plunkett, the son of a papal count, was a signer of the Declaration of Irish Independence and took part in the 1916 Easter Rising against British rule. He had left his sick bed where he was suffering from terminal glandular tuberculosis. He faced a court martial and was condemned to death by firing squad, but was allowed to marry Grace moments before being executed in Kilmainham Jail. This picture is an unknown artist's rendering at the Ard-Oifig an Phoist i mBaile átha Cliath. This song was recorded by Wolfe Tones in their albums: "1916 Remembered: The Easter Rising" and "Rebels and Heroes." le Seán Ó hAonaghusa, 2008. An mbeidh siad de thuairim gur theip orainn ? Ach nil uaim san áit dorcha seo ach tusa anseo i liomsa. I think about these past few weeks, oh will they say we've failed ? Caithfidh sinn slán a fhaghail le cheile. There won't be time to share our love so we must say goodbye. ba duail dom leaba a fhagaint agus dul cuige. 3. Anois, agus an grían ag éirí, tá mo chroí briste. Ar maidin Bhealtaine seo'agus mé ag siúl amach, beidh mé ag smaoineamh ortsa. go rabhas an oiread i ngrá leat gurbh fhéidir liom, fuil ar an rós a fheiscint. Ní beidh aon am ar grá roinn mar caithfidh muid a rá "beannacht." There won't be time to share our love so we must say "goodbye." Now there won't be time to share our love so we must say "goodbye." Madonna and child painted by Grace on her own cell wall years later in Kilmainham jail. She had rushed out to a Dublin Jeweler who was just closing and asked to buy an expensive wedding ring. They were married by Fr. Eugene McCarthy by the light of a single candle for there was a power outage. Two prison guards were the witnesses. The chapel was lined by twenty British soldiers with bayonnets drawn. Mr. Plunkett's poem, "I See His Blood Upon the Rose" is referenced in the song. This is a powerful and passionate song, one which we place at the top of our list of favorite contemporary pieces. Grace never married again. An unknown artist's rendering of the Military Council at a meeting lasting till 1 am Easter Sunday. The decision was made to take action on Easter Monday. Why should a place of suffering, despair and ultimately death be on the list of the top ten sites of Dublin ? The answer is "1916". After the failed Easter Rising the rebel leaders were incarcerated in Kilmainham Gaol, joining a long list of Nationalists held there, from Parnell to Emmet. 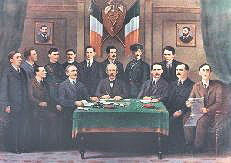 And more than a dozen men were shot, including James Connolly, famously strapped to his chair. The blood of these "martyrs" (a not unusual description) made Kilmainham Gaol hallowed ground to the Republic of Ireland. 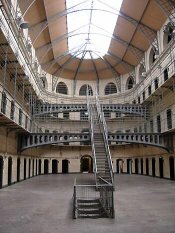 Príosún Chill Mhaighneann (Kilmainham Gaol) is the former prison, and the site of these happenings, located in Kilmainham on Inchicore Road, Dublin 8, and is today a museum. Grace Gifford Plunkett, Irish patriot, born 4 March 1888. For phonetics consult the pocket dictionary Fóclóir Póca or Fóclóir Scoile. Replay mp3 recording: "Grace" by the Wolftones.